Where are chefs finding inspiration for their food? What cooking trends and techniques have been inspiring them recently? How far have they come in their quest for sustainability? Our monthly Winnow Chef's Table series brings you interviews with chefs from all over the world, sharing some insight into their culinary origins and philosophies. For the 10th edition of Winnow Chef’s Table, we had the pleasure to interview Thomas Thinning Petersen, Executive Chef at Hotel Scandic Copenhagen. Born and bred in Denmark, Thomas has been cooking for more than 20 years and carries a very diverse curriculum. He has performed his culinary skills at the English Embassy, worked for Hotel d'Angleterre, one of Scandic's most traditional hotels, and even helped Unilever create high quality and delicious products. How did you arrive at Scandic Copenhagen and what were you doing before? I had a range of different jobs before I started working for Scandic, but I have always liked the company. I identify with their values. Scandic is a clean brand, they care about their guests, and they always give chefs the opportunity to develop their skills. So, almost three years ago when the position for a head chef at Scandic Copenhagen opened, I quickly applied for it. There were more than 60 chefs trying to get the job, but I end up getting the position. This is how my path with Scandic began. It is only my second year here, but I can already say that It has been the best partnership I’ve ever had in over 20 years of cooking professionally. We have a great team, and we are like one big family here, all caring about each other. I can see myself cooking for Scandic until I retire. I started working for a local hotel called Eremitage, in 1987 when I was only 14 years old. It was just twice a week after school, to provide help for a range of different departments within the hotel. I really enjoyed working there, but when the time came to choose a career I decided to become an electrician. Unfortunately, as soon as the course started I found out that electric engineering school wasn't for me. I just hated the lectures, and I really missed the friendly environment of the hotel. Fortunately, around the same period, Hotel Eremitage opened an apprentice chef position. I was hired by the chefs, fell in love with the profession and ended up spending 4 years there. I was fully trained by the chefs at Hotel Eremitage. I was an apprentice chef there for four years. The entire team always showed a positive behaviour towards having a piece of technology in the kitchen helping us reduce our food waste. Negative behaviour was never an issue for us. But we have over 100 people working here on a daily basis, they rotate a lot and cover 24 different nationalities. So, making sure that everybody was fully trained was particularly challenging in the beginning. Another challenge we faced in the beginning and still face today is the fact that we host big conferences very often, so our biggest challenge is to predict guest's preferences and behaviour, in order to cook just the right amount of food to avoid food waste. But, we are currently working very hard to find ways to be more efficient even when we are cooking for demanding conference guests. Winnow helps me in many ways. The technology has given me multiple pairs eyes. Now, I can identify certain problems that before I simply wasn’t able to notice. But, for me, the biggest help is making chefs and front of house staff more aware of food waste. At the moment, chefs think of their food waste even before they start cooking and waitresses are very careful with the amount of food they display in the buffets. 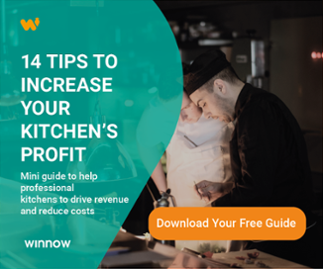 Winnow has made us aware that food waste is a serious issue, and our behaviour has changed because of that. After receiving the data from the Winnow report with all the information about our food waste we considered closing the breakfast buffet to reduce waste. We then decided to continue with the breakfast buffet, but we implemented small changes that are being very helpful. We are now using smaller dishes, and we are cutting down the number of buffets when the hotel is not fully booked. Soon we will start paying more attention to staff food as well because a large amount of our waste is coming from the staff meals. Here at Scandic, we care a lot about food and sustainability issues. We always try to source from organic and local farmers, and we encourage guests to think about their energy and water use. I believe this is because sustainability is a popular subject in Denmark. We are quite used to it. But, at Scandic, we have a very diverse staff and for many of them sustainability is quite new. Educating these people is challenging, but Winnow has definitely helped us with that, and I definitely see my team becoming more and more concerned about it. The first advice is to pay attention to what is coming back from the dining room to realize what items should be cooked less often or in smaller quantities. Also, is important to know how many guests are expected to eat, and cook only the necessary amount of food. But, the best piece of advice is to invest in technology to help them keep track of everything that is going on in the kitchen. It doesn't matter how good or experienced chefs are, we will never be as accurate and efficient as machines. We just can’t be on top of everything, all the time. I don't have one chef who I really admire, but I have many. A person like Gordon Ramsay might be controversial sometimes, but he has been extremely successful and is inspiring many chefs and home cooks around the world. I really value when chefs can inspire others. I also really admire pioneer chefs who are brave enough to start something new, and on the top of it can be successful in doing so. Charlie Trotter, for example, was one of these chefs. His books are old now, but they are still being used by many young chefs now-a-days. I am a great admirer of traditional Japanese sushi chefs. The discipline and the amount of work that they put in everything they do is fantastic. It's all about the quality of food. Recently, I have been cooking more vegetarian dishes, which has naturally taken me towards Pakistani and Indian cuisines. They have fantastic vegetarian dishes, and I have been enjoying exploring more about it. I have been trying many of these vegetarian dishes here at Scandic Copenhagen. Now, we always try to cook a vegan course for example, and guests love it. Vegetarian and vegan food is a trend and I really like exploring it. Any honest cooked meal, that can be appreciated with all my friends is a winner. I enjoy cooking for my friends, I love to see that they are liking the food and it is great when we can all sit at the table and eat together without any mobile phones for a few hours. I like many dishes. Pork fillet and duck roast are on my list of top dishes. These are popular in Denmark during Christmas, and it is just delicious, but I wouldn’t eat it on a hot summer night. So for me, It depends a lot on the weather, and on my mood at the time. Copenhagen, of course. It's the Scandinavian capital of Michelin star restaurants and I have the joy of living here. London is a great city to eat out, as well as New York. I have to mention Berlin as well. I always have a great time there.